There is no secret formula to entrepreneurship that makes the journey easy. If you can find someone who has had an easy path towards success, then they are a very rare exception to the typical experience of most entrepreneurs. Entrepreneurship is challenging and at times very frustrating, making you question if you made the right decision to become an entrepreneur. When success is finally produced, you learn to appreciate the difficulties you experienced. When you look back on your journey towards success, you begin to notice that certain factors and characteristics you possessed played a big part in helping you become a successful entrepreneur. Let’s examine some of the factors and actions that go into helping you become successful as an entrepreneur. Many people make the mistake of getting into business without knowing if their product or service is actually in demand. They blindly invest into their business without doing the proper research about the marketplace. The way to avoid investing into a bad business idea is by conducting the necessary research. Ask your potential customers would they be willing to use your product or service. If you get a lot of yes’s then proceed forward. If you get a lot of no’s then go back to the drawing board. No matter how good your product or service is, it will not be purchased if you cannot communicate its value. If you depend on the product or service to sell itself, you will find yourself going out of business very fast. Learning how to sell involves knowing your product or service value, knowing the pain points of your target customer, and being a great listener. These combine together to make you a great salesman, because you know how to effectively communicate with prospects. When your sales quotas are consistently met or exceeded you are provided the capital to grow your business. The first step that leads to sales is your marketing. If your marketing message is not targeted and effective, it will not be able to engage the preferred target audience. Marketing is all about communicating the experience provided by your product or services. You are showing people what they could have if they became your customer. Therefore, you want to make sure your marketing message conveys the desires of your target customer. You may be operating in an industry where the customers are dissatisfied with their current providers. They will immediately jump ship to another company that can provide them with excellent customer service. There is great opportunity to be had where others are lacking. Business is all about competition, so whoever does the best job is the one who reaps the rewards. Always provide exceptional service to your customers, so that your competitor’s customers will take notice and want to convert over to your business. Being too broad with your business can lead to you having to deal with a great deal of competition. When you are battling among too much competition, it becomes hard for you to gain the attention of the consumer. Working within a niche helps to differentiate your business within the competitive marketplace. When your products and services provide a specific solution to a particular type of customer, you are able to make more money by being the sole provider within this market. The main reason for businesses failing is due to poor money management. When your finances are not being controlled, you are not in the position to grow your business. You must set a strict budget for your business that guides your spending. Just because you are making money does not mean that you have the ability to spend frivolously. Put your money in the position to work for your business, instead of you having to constantly chase money in desperation. Entrepreneurship is a process and not one single act that produces a big result. Your actions will have to build upon one another in order to produce the desired outcome. Do not rush and make hasty decisions because you want fast results. This will only lead to you making a mistake that will take a lot of time and effort to correct. Momentum has to be built up over time in order for your business to develop and grow. Too many people want to be an entrepreneur just to make a lot of money. There is nothing wrong with making money but you must be focused on providing value to your customers. When you provide value to your customers, they become loyal to your business. Loyal customers are your staunchest supporters who do the marketing for your business. No other form of marketing is better than word of mouth marketing from highly satisfied customers. You can never become content as an entrepreneur. When you are content it leads to failure because you are not focused on working at the best of your abilities every single day. Your competitors are focused on gaining as much market share as they can, which includes your customers. Operate everyday as if you are working to gain your first customer. Once your ambitions is lost, you can sometimes never get it back until you fail. You do not want to have to deal with failure just to realize you have to work hard every single day within your business. Goals are what keep you focused. Goals help you develop initiatives, which keep you focused and productive. It is important that you determine the trajectory you would like for your business to take. Doing this gives you something to work towards every single day. When your goals are met, set new ones so that your business can continue to grow. 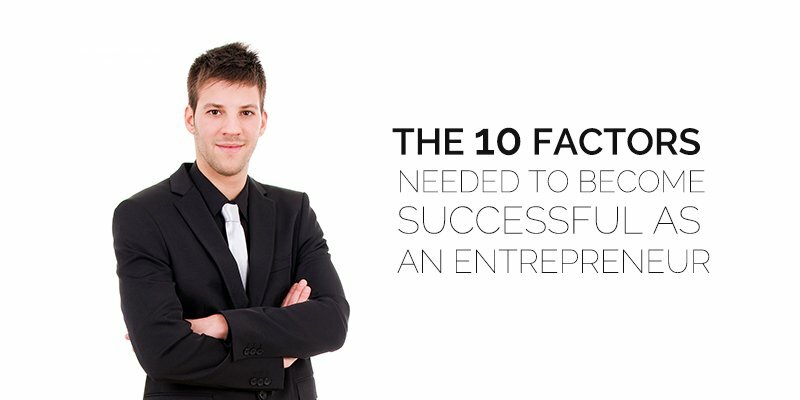 These are just a few factors that can lead to becoming a successful entrepreneur. What is important to realize is that entrepreneurship is a process of many different factors and and actions. Success takes time and effort, it is not something that is just handed to you.